The metal on metal brakes,,,,these brake pads are off a 2013 528 F10 front brake pads,,,,I have seen many people talking about why does 1 brake pad wear down faster then the other brake pads,,,,well I can tell you what I have seen over the years and replacing 100s of brakes,,,,what seems to be the cause is one of the brake pads gets hung up and is slightly rubbing against the brake rotor,,,,what I have always seen is the 1 brake pad that is worn down,,,,is that there is always to much anti-seize paste on the brake pads,,,,especially where the brake pads glides on the caliper part,,,,where the brake pads have the 2 ears that fit into the caliper holder bracket. 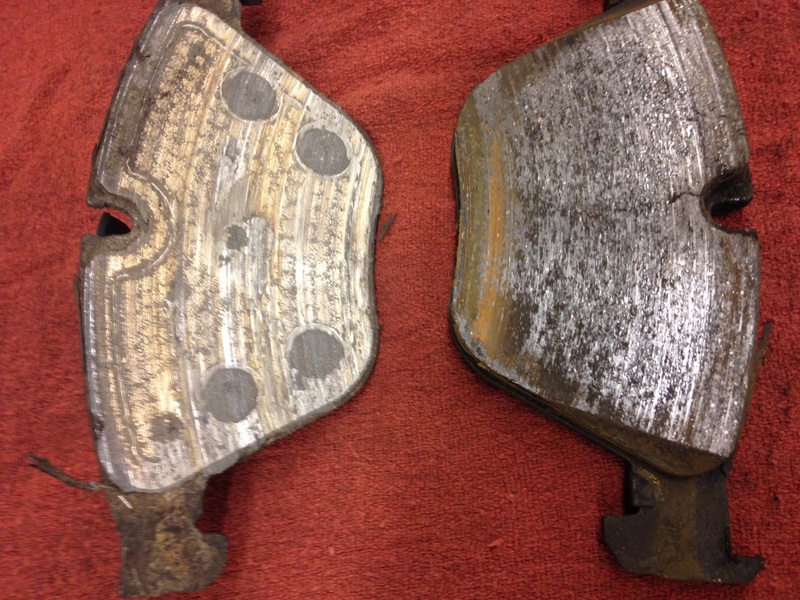 When’s there to much anti-seize on the brake pads and road dirt and grim build up on the anti- seize ,,,,then the brake pad starts to stick,,,,it also seems to happen on the inner brake pad,,,,,you very slightly see the outer pad get stuck and start grinding against the brake rotor. 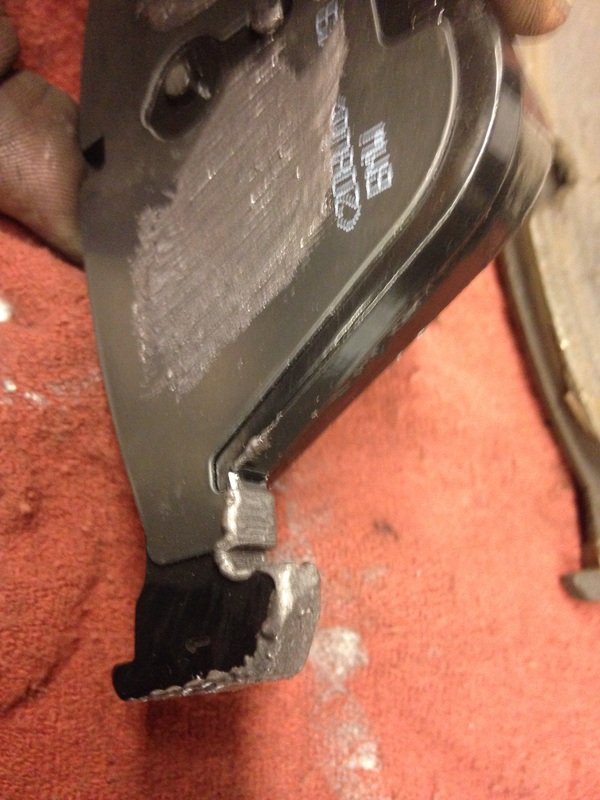 Here a picture of the anti-seize on the new brake pads,,,,puta thin coat on the back and on the 2 ears and you should be good to go,,,,,I hope this helps some of you. 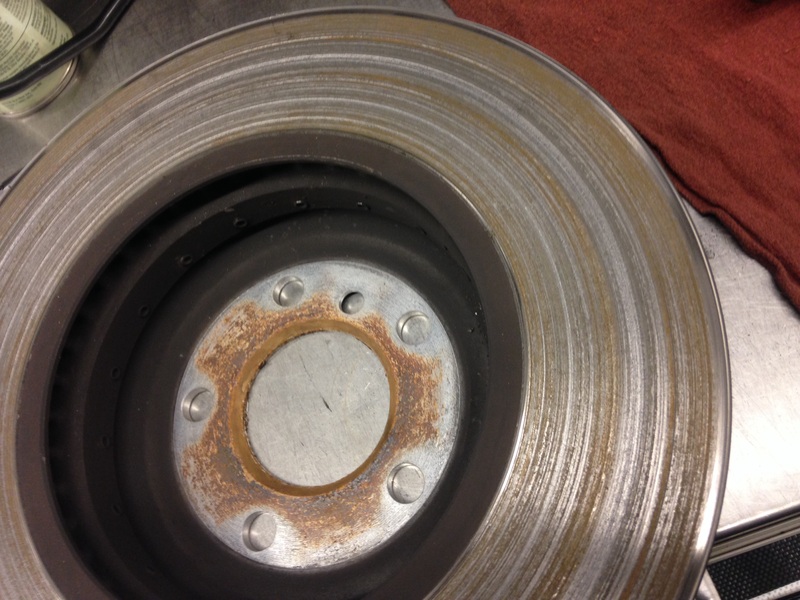 This entry was posted in Uncategorized and tagged Brakes grinding, metal on metal. Bookmark the permalink. Do you have to change the sensor every time on the E92 or you don’t have to? You can reuse the brake sensor only if the brake sensor wasn’t touching the brake rotor,,,,if the brake sensor has been touching it won’t reset,,,,now sometimes if the brake sensor has not been touching the brake rotor and looks just fine ,sometime it won’t reset due to it being to old.